LoveToKnow had the pleasure of interviewing zipper jewelry designer Kate Cusack. Kate creates unique jewelry out of zippers. Her jewelry has been featured in international fashion magazines, worn by celebrities and praised by both art and fashion critics. Kate Cusack does not see zippers as closures. She sees "a faceted piece of metal" and "a line which can be shaped into anything." For Kate, this means zipper jewelry. Working as a jewelry designer, costumer, wig-maker and window designer, Kate defines herself as "a versatile designer and creative thinker." She is an artist who works in many mediums. She views the world as a visual artist and sees potential for art in everything. Kate received her BFA from the Maryland Institute College of Art in 2001 and her MFA from Yale School of Drama in 2006. She currently designs zipper jewelry, costumes and wigs out of her New York studio. LTK: What led you to use zippers as a medium? KC: Zippers are exciting to because of their connection to fashion and to costume design by association. They are most appealing in form because of how the metal teeth sparkle and how the linear construction potential is endless. A line can be shaped into anything. A zipper is simply a line. LTK: Your artist statement mentions that you approach jewelry design as a visual artist rather than fashion designer. How does this approach affect your zipper jewelry? KC: Because I see everything as an artist, it means I am freed up from certain constraints that typically come with certain professional approaches. I can see the material for what it is, what it "should" be used for and then I can decide how I want to re-imagine it. As a jewelry designer, I don't set out to make a necklace with beads or sterling silver, but instead, I manipulate the zipper into shapes that are like beads, and I make a comparison between sterling silver and the base metals used in zippers. LTK: According to your blog, the zipper pin was your first zipper jewelry creation. What is the story behind the creation of the zipper pin? How did the pin lead to the creation of entire line of zipper jewelry? KC: I made my first Zipper Pin in 2002. I had recently finished designing costumes for a children's dance theater company and I got my hands on bags of zippers. At that point in fashion, pins and brooches seemed very in style. I was originally inspired by the idea of the Chanel flower and thrifty/resourceful decoration of fashion from the 1940s. Because of wartime restrictions on materials, designers were forced to be more resourceful with extra pieces of fabric to decorate their garments. I always love these kinds of designs because there is a bit of a self-referential notion and a simplicity when an entire garment from body to decoration is made from only one material. I made a Zipper Pin for myself and wore it on my jacket. I was freelancing in the visual merchandising department at Tiffany & Company at the time and the woman who I worked for, admired my pin. I was working there to design and create five Marie-Antoinette-style wigs made entirely from plastic wrap (like Saran wrap) for the store windows along 5th Avenue and 57th Street in Manhattan. I made the second Zipper Pin as a gift for the woman who'd hired me when the project was complete, as a thank you. A former high school classmate noticed the Zipper Pins and consequently placed an order for her new jewelry store in Brooklyn. NY Magazine wrote about the new shop and then decided to feature my pins in the Best Bets section of the September 2003 issue. 2003 was also the year I began my three year MFA program at Yale for costume design. In October, I entered the Zipper Pins in an exhibition at the Felissimo Design House called "Made in Brooklyn." They were accepted into the show and later sold at the gift shop. A number of buyers from other stores frequented that gift shop and later placed orders for pins. After about two years of making the Zipper Pins exclusively and working through a very intense graduate program, people asked for necklaces. So on a summer break, I made my first collection of Zipper Necklaces. In the summer of 2008, people asked for bracelets, so now I have a collection of Zipper Bracelets. LTK: You have a BFA from the Maryland Institute College of Art and an MFA from the Yale School of Drama. How has your costume design, sculptural/wearable art and experiences with theater and window dressing influenced your zipper jewelry?KC: I think that my experiences at MICA opened the door to the realm of "anything is possible." Annet Cowenberg taught a class in which she told us that any material can be either a line or a plane and from that you can make anything else. To make clothes, we weren't restricted to fabric, to make sculpture we weren't restricted to marble. At Yale, it was surprisingly quite the opposite. A great value was put on historical accuracy, as far as costume design was concerned. I am more aware of historical references in my jewelry design, as a result of my studies at Yale. I think all of these experiences-costume design, window display, sculptural/wearable explorations-culminate in the Zipper Jewelry. They all relate to the body and combine those theatrical influences and love for the transformation of unusual materials. LTK: A Cool Hunting article mentions that your zipper jewelry is influenced by "Chanel Camellia and the sartorial thrift from the 1940s." How would you describe your zipper jewelry style? KC: In the current "fashion-speak" I think my jewelry is "statement jewelry." 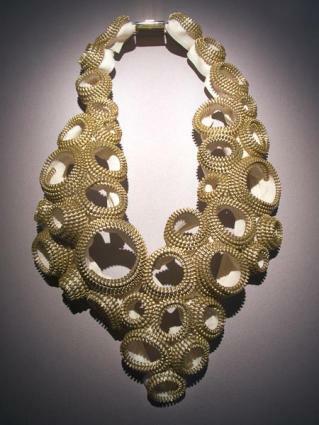 As far as the world of wearable art is concerned, it is simply art jewelry. It is like wearing a mini-sculpture on your body. It is meant to get noticed and the wearer becomes the living gallery that it exists on. LTK: What are your future plans for your zipper jewelry? KC: I am excited about exploring new forms of jewelry, especially earrings and rings. I will continue to create new designs and hopefully continue to reach new audiences. I recently collaborated with the fashion designer Nary Manivong. My Zipper Jewelry accessorized his Autumn /Winter 09 collection at his fashion week fashion show. It was really incredible experience and we all agreed that the Zipper Jewelry complimented his collection perfectly. I would be interested in continuing that collaboration or building towards other fashion collaborations. My goal is also to find new boutiques that are interested in carrying my work. Any suggestions are always welcome! 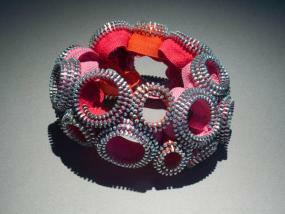 To find out more about Kate Cusack or purchase her jewelry, visit the artist's website and blog.